Suffering an injury or having to go through a major surgery is a terrible experience for anybody -- doubly so for an athlete. I spoke with a collegiate volleyball player recently who came off a major surgery last year and was going through the rehab process with one of the university’s athletic trainers. During rehab, she wasn’t always truthful. She would say she was feeling great, even though she wasn’t. She would say everything was fine, even though she knew something didn’t feel quite right. She ended up getting hurt again with the same injury and had to go through a second surgery -- forcing her to sit out the whole season she was trying to get back to. She wanted to get back on the court so badly that she was not willing to be completely honest and vulnerable with the trainer whose job it was to get her back -- and it cost her. How often do we do the same in our own lives? We look at vulnerability like we used to look at broccoli when we were kids -- we want nothing to do with it. We would much rather try and figure things out on our own and not ask for directions even though we’re pretty sure we’ve been driving around in circles for a couple hours. But we need to be vulnerable. We need to be able to say Hey, I don’t have it all together. I need help. Vulnerability is not optional, but essential in our relationships with God and those who are closest to us. Healing requires vulnerability. It requires us to be honest with God about everything that we’re feeling and everything that we’re going through. Not for His benefit, but for ours. He already knows what’s going on. We can’t hide from God, so why not be completely honest with Him? But just like an injured athlete, if you’re not willing to cooperate with the process and disclose everything to the One who is there to help you recover, then you’re only hurting yourself. If we are going to develop a thriving, flourishing and enriching relationship with God, we need to trust Him with every part of our lives. You can’t be vulnerable without trust. We need to trust Him with our desires, our struggles, our dreams before God. Your experiences are valuable. Your story is valuable. Everything in your life is there for a purpose. Your past or present pain can let someone else know that they are not alone. Your deepest hurts can lead to someone else’s deepest healing -- and yours, too. We can’t guide others, serve others, love others or help others without becoming honest and open about our own lives first. We can try to edit out the bad stuff in our lives and puff up the good in an attempt to portray some kind of perfect life, but instead we end up creating a mask -- a false image of who we are. For me, blogging has been my avenue to becoming more vulnerable. Maybe becoming vulnerable looks like having a cup of coffee with a trusted friend. Or it could be writing poems and songs. It could be sharing your experiences with someone you are mentoring. Don’t hold your life back from people who need it the most. Make no mistake: becoming vulnerable is frightening. It means we are putting our hearts, our minds, our lives in God’s hands. And that means giving up a false sense of control we think we have. The list of things that kept me from being vulnerable with my own life was long -- embarrassment, fear of disapproval or getting hurt by others, pride, and guilt to name just a few. Maybe someone betrayed your vulnerability and trust and you’re afraid to become vulnerable with anyone else. Are there risks to being vulnerable? Absolutely. Are there limits to how vulnerable we should be? Definitely (Everyone doesn't need to know everything about you). But the risks of not becoming vulnerable are even greater -- a life filled with regret and loneliness, empty of love and service. 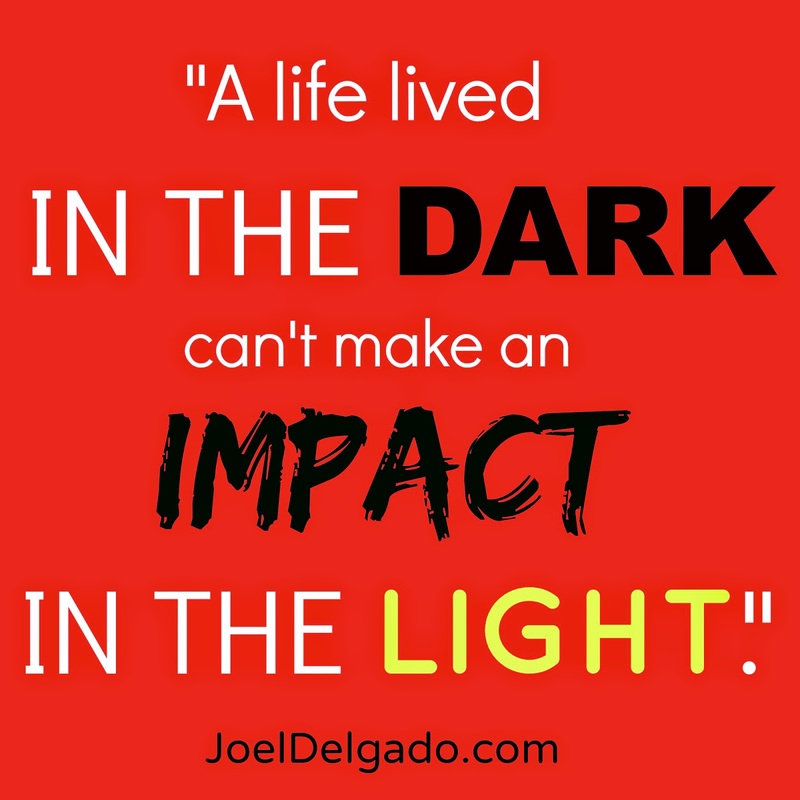 A life lived in the dark can’t make an impact in the light. Becoming vulnerable means placing your life in more capable hands -- God’s hands. Becoming vulnerable means not being afraid to ask for help. Becoming vulnerable means being real with who you are, what you struggle with and who you want to be. Becoming vulnerable means sharing your story with someone so they can learn from what you went through. Becoming vulnerable means throwing down our masks and allowing God to use our lives in ways we couldn't dream possible.